This is so typical of TPG blame everyone else,, how about you TPG hold some accountability? You're now one of Australia's MAJOR Internet Provideres. Instead of buying up all of these smaller companies, how about you start listening to what your cusomers are saying. And Yes I am a TPG customer, I am on the 50Mbps plan and I cannot pull down on a good day 21Mbps. How about taking care of the Contetion Ratio and service your clients what they are paying you for. NOT ONLY ARE THEY NOT EVEN GETTING CLOSE TO THE 50 THEY'RE NOT EVEN MAKING IT TO 25Mbps. NBN 50 44.5 Mbps WHERE?? I have swapped out again yet another new Ethernet cable (the shortest you can get). I have shut down the router for 5 minutes. Still cannot get better results than the ones shown. I'm not claiming to be an IT guru, but I do know how to troubleshoot, and I know my around a PC. I am the only user in my home, ethernet connected!! I want my speed looked at now please!! NBN Speeds Typical Evening Download Speed is measured between 7pm and 11pm. The actual speeds for the service may be slower and vary due to many factors including type/source of content being downloaded, hardware and software configuration, the number of users and performance of interconnecting infrastructure not operated by TPG. 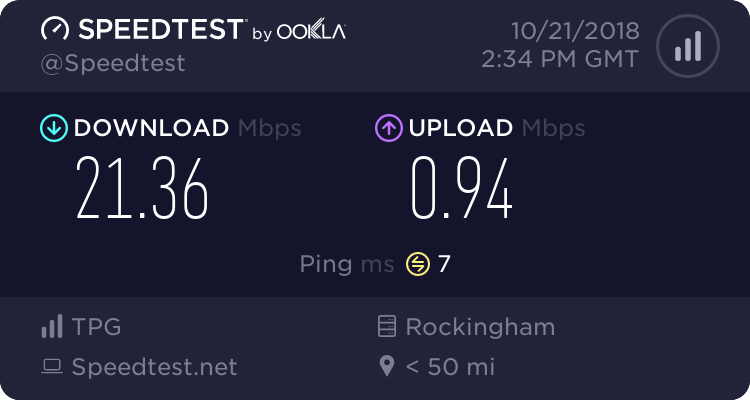 @Fiery I understand what you are saying and are frustrated that you are not getting the speeds you expected. The issue on your case is not bandwidth as we have more than enough in your area. The problem with your particular connection is the socket's physical cable distance from the node. NBN Fibre to the Node is an advanced version of the DSL technology wherein the copper cable distance is a major factor in determining the speed. I would suggest you downgrade your plan speed as you will not get near the 50 Mbps due to the physical capabilities of the infrastructure. "The problem with your particular connection is the socket's physical cable distance from the node. NBN Fibre to the Node is an advanced version of the DSL technology wherein the copper cable distance is a major factor in determining the speed." So please tell me why when I rang your Tech Support, and made this complaint, he said yes I can see a fault at our end? There's no evident fault on the NBN network, however, since you are getting a very low sync speed compared to what you should get, our Tech team escalated the case to our Engineering team for further investigation. They've lodged the fault to NBN Co for further test and they are awaiting updates to be provided. I'll chase this with our Engineering team and have someone to contact you within the day to provide further information about the progression of the case. Originally when I signed up with TPG it was with ADSL2+, streaming could get a little sketchy at times, but overall the distance I was from the Tower I was bordering on the rim, I was pulling down 5Mbps, and the streaming was smooth. 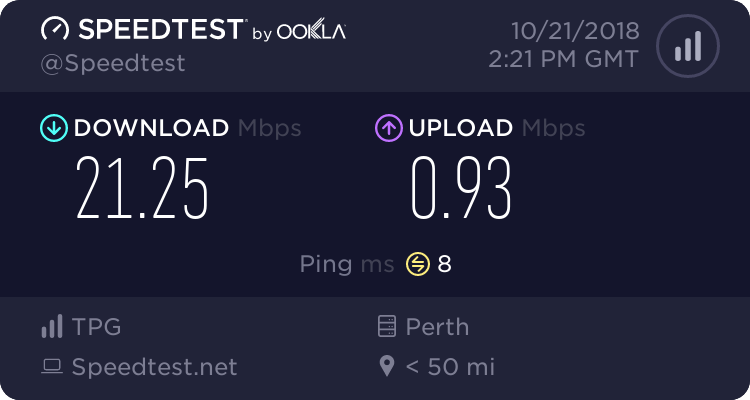 When NBN became available, I waited a good 12 months before signing up and I took the 12Mbps plan, mainly because I didn't know what node I would be connected to, my download speed increased to 11Mbps, and streaming was sweet no stop start no buffering. Then all of a sudden the stop start of streaming started again, nothing would buffer to where I could watch it. Upgraded to the 50Mbps plan as I said I haven't been able to get above 20 /21 Mbps, but at least the streaming was lightening fast, now according to the speedtests I'm doing the download speed is still at 20 /21 Mbps, but ONCE AGAIN my streaming is stop start, it's taking forever pages to load, and some even time out because there's just no speed. Thank you for sharing further your previous experience with the service. We will inform your assigned Engineer to check on this and follow up with the result of the NBN Co's investigation. Someone will be in touch within the day to provide updates with the case. I understand that our Engineering team has been in touch and a TPG technician was requested to help us with the investigation. They are still waiting for the available schedule to check the service. Further updates will be given by them once available. Yes, he arrived two days earlier than was arranged, he went to check on do? something outside of my home. When he came inside, I had the speedtest.net website up, and I don't wtf he did BUT if I was whinging about my 20/21Mbps I should have shut up, my only regret is that I didn't thik to do a screen dump. I was pulling down 5.88Mbps friggin ADSL2+ speeds. Then as expected, he tried blaming the copper wiring. I said to him how can I lose 4 - 5 Mbps if it's the copper wiring and it's only since you restarted my router, that I have lost speed? He then said he needed to go to the node and to expect dropouts for the next half an hour, I sat with Network and Sharing page open for a good hour, there wasn't one singular drop out. So wtf did he do? Go to the foreshore for a coffee? I apologise for the inconvenience. I've seen you have been in contact with one of our Engineers and advised the case progress, current findings show a possible internal cabling issue causing the speed issue. I will raise this to one of our Complaints Resolution Case Manager and request for urgent feedback.